These melt-in-mouth treats come in many flavors! Rum Russian – “rummy” tasting bonbons rolled in chocolate vermicelli. 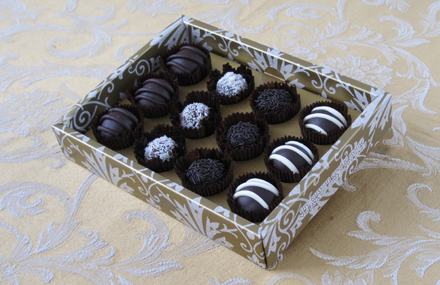 Dark Coconut – a delectable combination of coconut and chocolate. Cappuccino – cappuccino flavored treats coated in bittersweet chocolate. Black Forest – infused with cherry brandy and rolled with bits of walnut, dried cranberry, chocolate chip and coated in bittersweet chocolate.